A 32 hours Intensive course is a good way of starting your Portuguese learning in Maputo. Lessons are 2 hours every day for 4 weeks, Monday to Thursday. 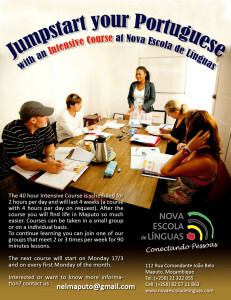 After the course you´ll find the life in Maputo so much easier. You can choose between Group Intensive Course and Private Intensive Course. Our dedicated teachers will make you ready to connect with more people. We start a new Group Intensive Course every month and we welcome 4 students to a group. If you prefer Private Intensive Course we can be more flexible with scheduling. Next Group Intensive Course starts 1st Monday every month and and will be running 4 weeks. You can contact us by sending an email (nelmaputo@gmail.com) to us or call us at +258 846 16 89 22. Please fill in the form below if you are interested in our Intensive Course.